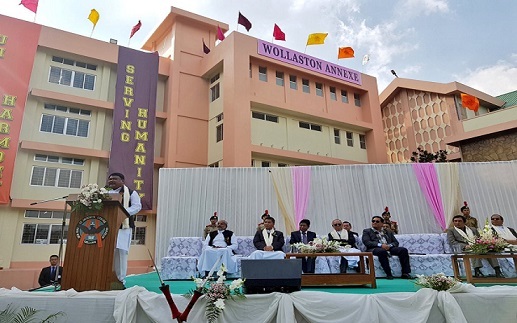 Union Minister for Tribal Affairs Jual Oram on Saturday announced that 36 Ekalavya Model Residential Schools will be set up across Meghalaya at Rs 20 crore each within three years. Union Minister for Tribal Affairs Jual Oram on Saturday announced that 36 Ekalavya Model Residential Schools (EMRS) will be set up across Meghalaya at Rs 20 crore each within three years. He said this while addressing at the inauguration of Rev Fr D J Wollaston Annexe building of St Anthony’s College, Shillong. The Minister also reiterated his Ministry’s commitment towards uplift of tribal population across the country. Oram said construction of two EMRS is currently going on in two different places in Meghalaya. He also assured that his ministry will extend all possible help towards infrastructural development of Meghalaya. Highlighting immense contributions of St Anthony’s College and for taking up challenges to create better facilities year after year, Meghalaya Chief Minister Conrad K Sangma said that the college had taken up the project with a vision and ensured its success. He also stressed the need to properly polish human resources of the state with skills and knowledge. “If we do not have proper policy to harness and groom our talents, we will not be able to take maximum advantage of the infrastructure we create,” he said. The chief minister also urged researchers and academicians to provide constructive suggestions for framing policies to better the infrastructure and opportunities for the youth as well as ideas that would help the state generate its revenue. The Wollaston Annexe building of St Anthony’s College has 27 classrooms along with laboratories, three departmental offices and one executive conference hall.